Our Medium Status Jars burns for approx 40 Hours. The contemporary frosted look and metal label along with the creamy soy wax steal everyones gaze and adds to any surrounding space. We recommend our medium Status Jar for an average sized sitting room or bedroom. It is a nice cup size and good value as an everyday candle as it is long burning and can easily fragrance pleasantly a room. After your candle is finished the container can be cleaned and reused. 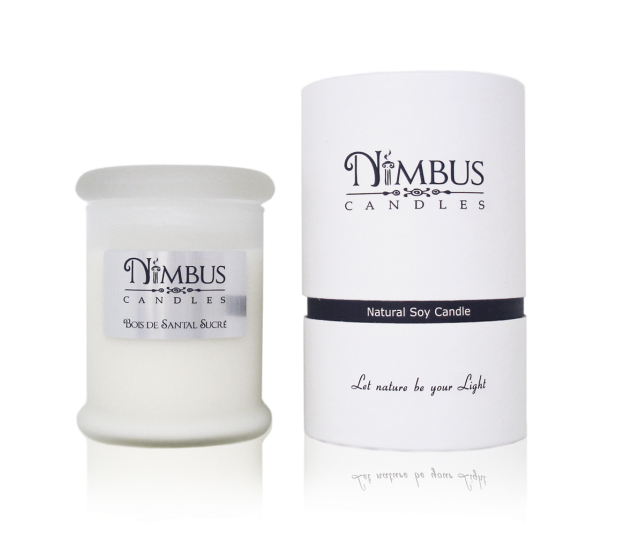 Every Nimbus Candle comes in its stunning recyclable heavy duty paper tube box. Making it a great gift and assuring safe shipment. We have a variety of 27 scents for you to choose from. For a description of our scents please use the drop down list bellow.